The SC-12 Xtreme 12-Station HD Charger features 12 independent charging stations, each offering 12V/6A charging capability. Because each channel is completely independent of the others, you can charge any combination of 12V lead acid batteries at the same time. With its durable wheeled case, the SC-12 can be moved to wherever your batteries may be: on the pallet, in a shop, or on a storage rack. The charging system is completely automated, with no dials or switches to set, and reverse polarity and overcharge protection, this is a truly 'set it and forget it' charger. Five LED indicators next to each cable connection display the status of each battery channel at all times. The twelve independent charging channels profile the condition of each battery and then automatically cycle through a charge and recovery process that applies the correct charge (variable up to 6A) and our optimized high frequency pulse to each battery. 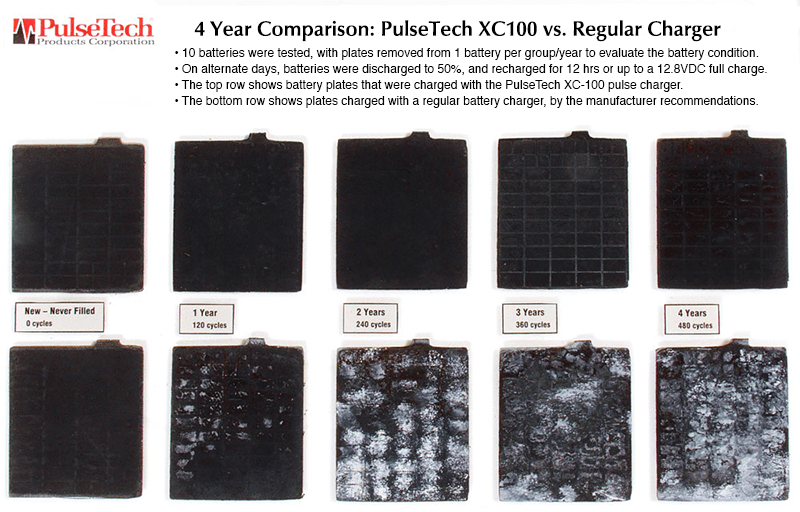 This patented technology removes sulfate deposits on battery plates, increasing the battery's ability to accept, retain and release energy, making existing batteries last longer.